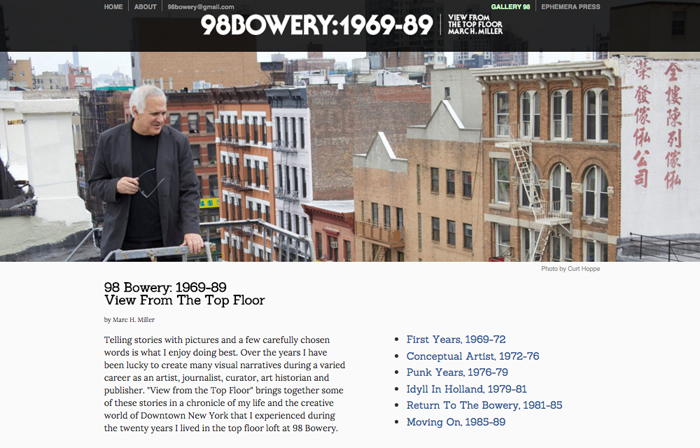 Looking backward is nothing new for the website 98 Bowery and its commercial offshoot Gallery 98. These sites aim to keep alive the radical fringes of the downtown New York art scene of the 1970s and ’80s by recounting tales and selling art and ephemera. 2015 has been a good year for the 1970s and ’80s. Many of the artists featured on Gallery 98—like Christy Rupp, Anton Van Dalen, Jane Dickson, Peter Fend, Joseph Nechvatal, and Walter Robinson—have seen interest in their old works and their new creations. Neke Carson’s Works on Art and Rectal Realism was the realization of a book he first mocked up in the 1970s. Marcia Resnick’s Punks, Poets, and Provocateurs was the fulfillment of a project begun in the 1980s. A new book by COLAB stalwart Alan Moore, Occupation Culture: Art and Squatting in the City from Below, showed that art history did not have to be rooted in the art market. 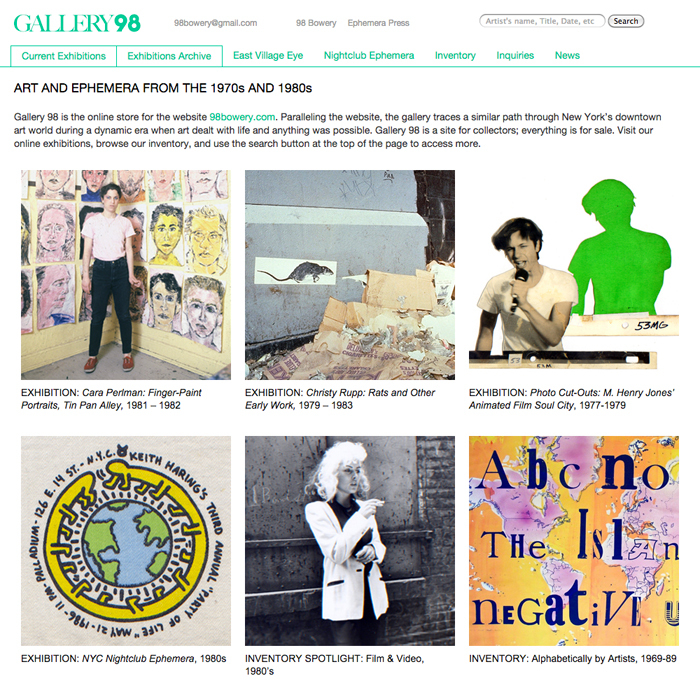 With art-world interest in the 1970s and ’80s riding high, Gallery 98 participated in a number of gallery shows. Anthony Haden-Guest’s “The Last Party” at White Box featured many of our favorites, including Roberta Bayley, Anton Perich, Curt Hoppe, and M. Henry Jones. Works from the Gallery 98 inventory by Colette, Kiki Smith, Christof Kohlhofer, and others were part of Glenn Horowitz Rare Gallery’s exhibition “The Downtown Decade,” documented with an illustrated catalogue (pdf). Howl! Happening, a new East Village space opened by Jane Friedman, exhibited Arturo Vega, Lydia Lunch, Clayton Patterson, and a Pyramid Club retrospective. Marc Miller, the founder of Gallery 98, is an advisor to the space. 2015 has also seen many of the picture stories featured on 98 Bowery picked up by other media outlets. The Huffington Post spotlighted the 1978 Punk Art catalogue with an article provocatively titled “16 Images that Capture the Dark and Beautiful Love Affair Between Art and Punk.” The Guardian, Dangerous Minds, and Flavorwire all did spreads of the photo series “Bettie Visits CBGB” by Bettie Ringma and Marc H. Miller. The duo’s slightly later series of Amsterdam bar portraits was the subject of a picture story in Vice translated into nine languages. We eagerly await 2016. Howl! promises shows on Punk magazine and the East Village Eye. This will be the year for the eagerly anticipated books History is Made at Night, comprising photographs by David Godlis, and A Book about Colab (and Related Activities), edited by Printed Matter director Max Schumann.